Computer Processors: Intel vs. AMD - Computer PRO Unltd. Intel has consistently provided high quality processors for the computer market while maintaining a reasonable price. Every so often, the AMD brand establishes a new product into the marketplace that raises new questions about performance and value. This generation is extremely competitive, especially when taking an in-depth look at the 9th Generation of Intel processors that provide more power and performance than ever before. There are all new Intel I5, I7, and I9 processors that feature new capabilities that enhance the computer gaming experience. These processors are capable of moving beyond the standard quad-core design that Intel has published in the past. Many of Intel’s newest processors offer six cores instead of four, which surely has a major impact on their performance. In terms of performance, reliability, and overall value, it appears that Intel has a slight advantage over AMD, but this minor edge may not be enough to outlast many more generations of improvements from the AMD processor brand. Time will tell whether Intel can fight off yet another competitive market challenge from AMD. This market has seemingly been a rivalry that has stemmed into neck-and-neck action for some time, but the overall competitive spirit of the market changes rapidly in a technological world that continues to improve. AMD’s state of the art processors from this generation have certainly spiked interest, particularly with the AMD Ryzen 7. This particular processor could be considered one of the best market values that are currently available for a heavy duty processor that gets the job done. It slightly undercuts the price range that Intel has presented, but that is to be expected in a market that is constantly changing in value and competitive spirit. AMD has established their new processors as an alternative choice for customers that are willing to take a chance on good value, while maintaining respectable price ranging. Customers may be willing to respond positively and take a gamble on the AMD Ryzen 7 in an effort to save money from the slightly higher priced 9th Generation Intel processors. 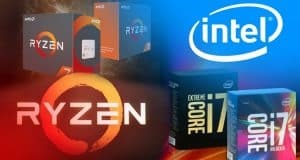 There are some cases where the all new AMD Ryzen could compete with the speeds of the Intel chip, which is something to consider when analyzing the market to potentially make a purchase. It all comes down loyalty for customers and whether Intel customers can find it within themselves to consider an AMD processor for this generation of computer technology. For some customers, it may be a no-brainer decision. For other customers, this could potentially be a complicated decision that leads to buyer’s remorse when all is said and done. The rivalry between two of the highest rated processing brands has gone on for several years, and there are no signs of this rivalry ending anytime soon as the next generation of hardware is unleashed among the market. AMD has shown remarkable tenacity by establishing a clear response to the Intel processors that have dominated the market for many years. AMD’s response to Intel has been interesting and striking to say the least. They have managed to stay relevant and power through tough times in an attempt to establish a golden age for themselves. While their efforts may land somewhat short of a technological golden age, they will certainly notice a response from customers if they continue to make a push in the processor marketplace. The future of the AMD vs. Intel rivalry is likely to remain competitive for many generations of hardware. The real question comes down to which brand makes a larger push in the market. Intel certainly has been ‘playing from the lead’ for the last several years, but they are now experiencing a flurry of activity from their AMD rival. 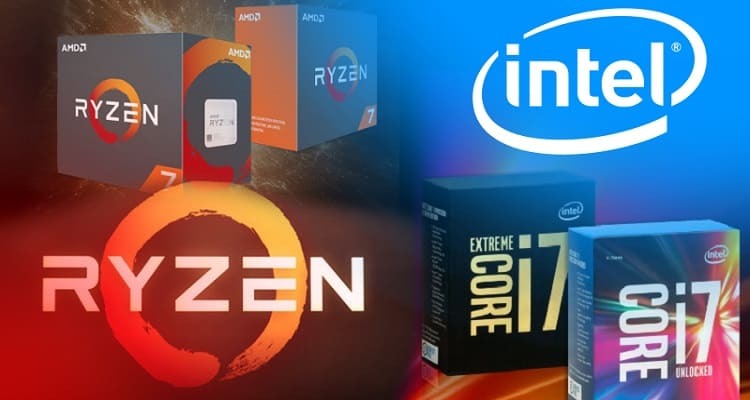 The toughest decision for customers is usually related to balancing performance and price when looking for the best CPU hardware from the Intel and AMD brands. The all new AMD Ryzen 7 will surely convince some customers to give it a try for the slightly lower price range. Other customers will likely remain loyal to Intel, rather than making the swap to AMD. There is nothing wrong with either choice, because at the end of the day this decision comes down to perspective. You may be intrigued by AMD’s recent push to grab the attention of the market, but is it enough to convince you to spend hundreds of dollars on their state of the art computer processors? That is a decision that only you can make. The online gaming community has been struggling with this rivalry for many years, and there are no signs that it will stop any time soon. AMD is an alternative choice to a great brand of computer processors that has a proven track record. Intel remains the top dog in the market, but for how long? Only time will tell, but the online communities and markets will continue to observe the balance of this rivalry.